The world changed for Lewes FC in July 2011 when Brighton & Hove Albion moved into the American Express Community Stadium, located just one train stop or 4.7 miles from The Dripping Pan. We always knew that there would be an exodus of fans to the new stadium and hoped that the fixture computer would be kind to us and not arrange any major fixture clashes. The first half of the season saw just two such clashes, which had around a 20% impact on the gate. So we (the board of directors don’t you know) decided to experiment with the game on Bank Holiday Monday with Horsham when the next clash was due to take place and decreed it would be a midday kick off. The reasons for this were plentiful. 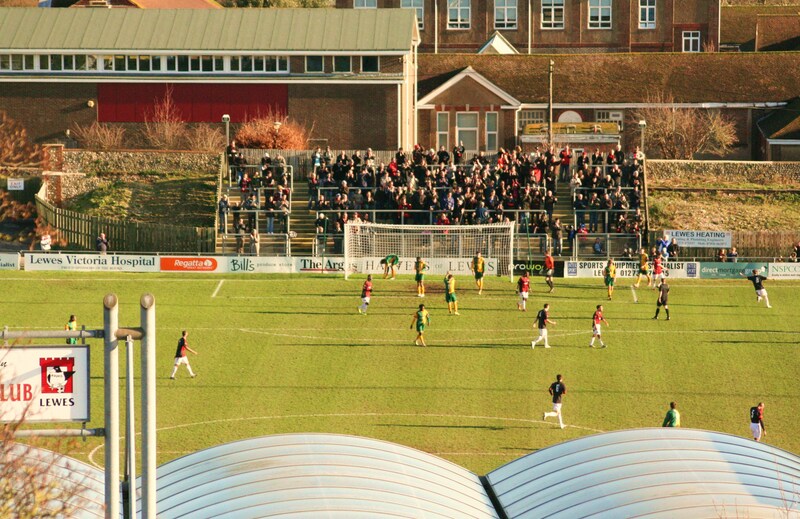 A local derby against one of Lewes’s oldest rivals, and one just 30 minutes away by car was always going to attract a large crowd. Coupled with Brighton’s “local” game versus Southampton at 3pm, the fact that Lewes has become the place to “park and ride” for the Amex, as well as the local licencing laws meaning the pubs couldn’t open until midday anyway. Finally, Plumpton racecourse was hosting the Sussex Grand National no less (Many thanks to Eddie The Shoe for the tip on Double Dizzy) so a few of the crowd may be planning to head up to the estate of Lord Plumpton and lay a bet or two and keep him in fine wines and cigars for another year. So we (the board) voted overwhelmingly to move the game. Every fan at this level matters. The average league attendance at The Pan this season is 599, the second best in the league behind Lowestoft Town. But on the two occasions when the game has directly clashed with Brighton, the attendance has on average been 521. Per game, we see £11.54 spent per paying fan so that 78 difference costs us around £900. For a small club that is quite a bit of cash. So by moving the game to an earlier kick off not only will we not lose those 78 fans, and their £900 but we may also gain a few “early doors” Brighton fans (in theory). And if we can get 100 of them then we will see another £780. Grown up thinking? We will see. The world of watching Lewes for me changed on the 27th October when I joined the board. I now feel the pain of every ball that is hoofed out of the ground, every player that goes down holding his leg and every Golden Goal ticket left unsold. Such is the community spirit now within the club that there is a regular sweepstake among the Lewes Lunatic Fringe not only on the final score, but also the crowd. Anything that starts with a 5 normally produced a frown, a 4 is a wince and a 6 or above a smile. Today was going to be interesting though. With a number of pubs in the area also not open until 12pm the Rook Inn could be the social hub of the town. It would also mean I got to see my mate Hugo Langton. One of the nicest people you could ever want to meet, I first met Hugo a year ago (well, 364 days ago) when he was a coach at Thamesmead Town. He then joined Horsham in the same capacity in the summer and then in the Autumn stepped into the hot seat. 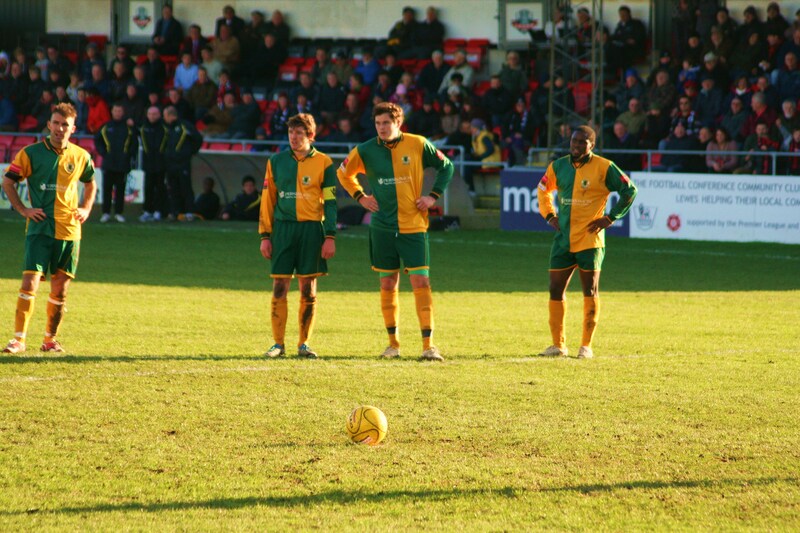 Despite all of his efforts, Horsham are still rock bottom of the league and came into the game on the back of seven consecutive league defeats. What odds would you get on a away win today? Could they do a Blackburn and upset the form book? Lewes 1 Horsham 1 – The Dripping Pan – Monday 2nd January 2011 With all three additional minutes played in this game, Lewes were wasting time in the corner, happy that a 1-0 win would take us closer to Billericay at the top of the league. Twenty seconds our Bank Holiday world had been turned upside down as the visitors broke and scored with literally the last kick of the game. Fair? Well, actually to some extent, yes. By 11.30am there was a good five hundred in the Dripping Pan, and our initial pessimistic view of a crowd of 600 looked wide of the mark. The “Brighton factor” or more likely Danny Last’s networking, had pulled in a number of early doors Seagulls fans, resplendent in their candy striped shirts. Extra hands were being employed in the Rook Inn and in Maria’s kitchen where Venison pasties were on the menu (They didn’t sell very well according to Mr Freemantle because they were too deer!). The sun was shining, the beer was flowing and people were loving the early start. What could go wrong? 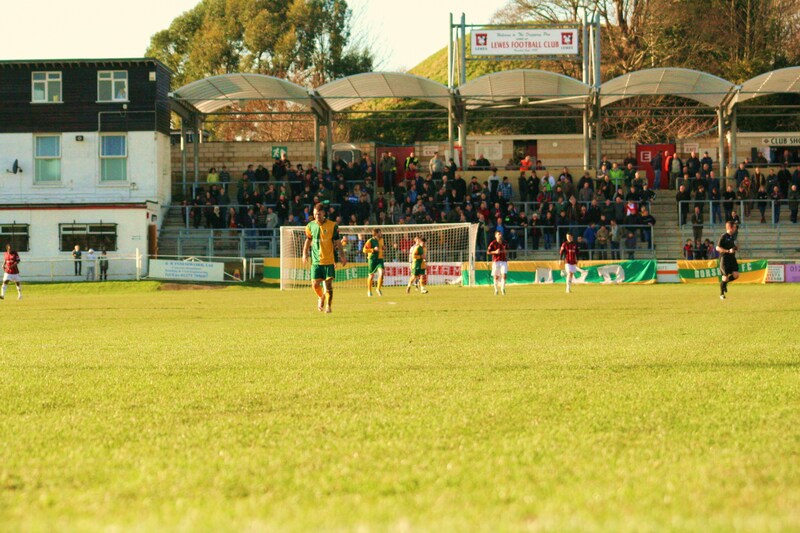 Horsham’s fans had turned up in big numbers, complete with big flags. They didn’t let up their support for their team throughout the 94 minutes, despite their team’s wretched form, and it was the visitors who had the better of the opening exchanges. In fact if it wasn’t for the reflexes of Rikki Banks they would have been a couple of goals to the good within the first half an hour. With such excellent weather I decided to climb to the top of the mound outside the ground to get a different perspective on things. 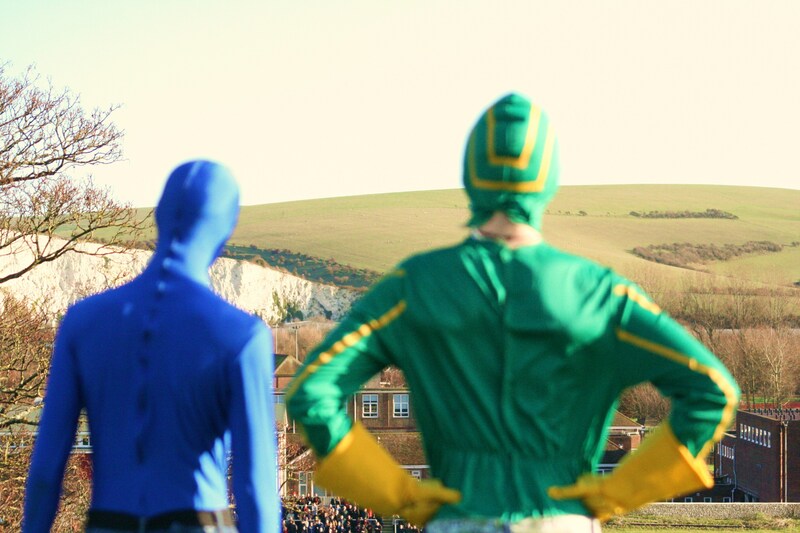 The mound was made, apparently, from the earth moved from the site of the Dripping Pan and commands fantastic views over the ground to the South Downs as well as Lewes Castle to the North. Within minutes Lewes took the lead. Nanetti crossed and the every impressive Harry Harding smashed the ball home. 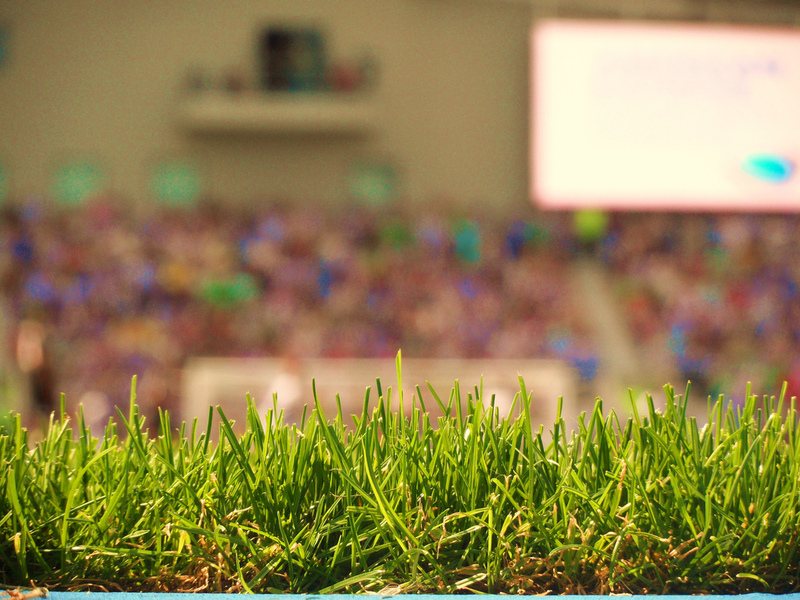 As I cheered from my lofty position I saw a flash of green out of the corner of my eye. I turned my head quickly to the side, but saw nothing. Then again, but from the other side of the mound. I must have been seeing things, with Northern Rachael’s punch from New Year’s Eve now taking on hallucinogenic properties. But no – straight ahead of me panting as he climbed the final few steps was a man (I think) dressed as the Green Hornet, complete with mask and yellow gloves with flashes on. He was followed by a man (again I think) with a blue full body suit on. They looked at me, I looked at them and then they turned, pulled out a video camera and started shooting a make-believe super hero action scene. Two’s company, three’s a crowd so I left… The second half saw Lewes more comfortable on the ball. Nanetti was again teasing and tormenting the full back into mistakes, and it was inevitable he would be booked for one foul too many. However, it was a surprise that it remained 1-0 until the 72nd minute when Horsham’s Hunter, who had just saved his team with a great stop, brought down Harding in the area. It became obvious that with first choice (Ciardini) and second choice (Booth) penalty takers on the bench, no instructions had been given to the team. Queue a farcical scene of bickering between a group of players before rock, scissors, stone decided that Albert Jarrett would take the kick. It wasn’t the worst spot kick you will ever see but Hunter dived and parried it away. Time ticked down and Lewes seemed happy to hang on for a 1-0 win. But then with time up Horsham broke and the ball fell to Kedze on the edge of the box and his shot beat Banks and rippled the net. A collective sigh went up from the crowd at one end, ecstatic cheers at the other as the form book had indeed been upset again. It wasn’t all doom and gloom though. The official attendance of 1,005 beat our most optimistic expectations, and was over 400 higher than our average. If all of them spent their £11.54 it would have been a very successful financial decision to move the kick off. Time will tell but for now we just had to be content with a point and our place in the top four. More pictures from the afternoon can be found here.